ORLANDO, FL: ISE Alumnus, and member of our Hall of Fame, was recently featured in Florida, the Magazine of the Gator Nation. Read on for the story…. Erin Wallace stands on Route 66 in front of Flo’s V8 Café at Disney’s California Adventure. Out of the corner of her eye, she catches a flash of red as Lightning McQueen zips between the crowds. It’s another one of those Disney days, she thinks. 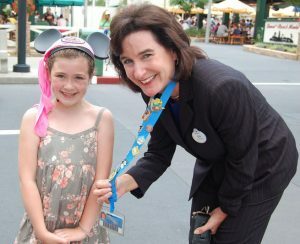 As executive vice president of operations integration for Walt Disney Parks and Resorts, the 52-year-old, who is based in Lake Buena Vista, Fla., is used to these moments — the times you can feel the magic and see the pixie dust in the air. Her responsibilities are broad and diverse. On any given day, her team could be focused on new menu concepts, amenities and services, or operational improvements at all of the Disney Parks and Resorts worldwide. She reviews initiatives involving everything from merchandise to animal viewing, while balancing day-to-day tasks such as heading meetings and leading teams.